Welcome to our Early Education & Child Care program. We are glad you are letting us be a part of your child’s early years. We are striving to make it the most enriching and positive experience possible. This is general information about our programs, policy and procedures that we feel is helpful for you to be aware of. You are welcome to visit any of our programs, but we would like to be advised ahead of time so that your visit does not conflict with other visitors. We want you to feel welcome and comfortable in our school. Regular routines are important to young children. We recommend that parents set up regular hours to drop off and pick up their children. We would like to remind parents that the school’s closing time is 6:00 p.m. If you are unable to pick up your child by that time, please make other arrangements for someone else to do so. Just call us and let us know. Reminder: a late fee is charged and 3 late pick ups results in termination of care. 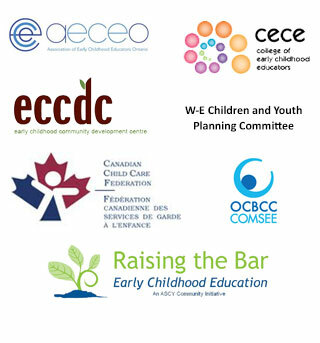 The Child Care and Early Years Act states that children must be signed in and out by the parent each day. Upon registration you will be asked to list any persons other than yourself that will be permitted to pick up your child. Unless otherwise arranged, children will only be released to those who are specified on the registration forms. For safety reasons, we encourage only parents, teachers, adults, etc. to open the gate and the doors to the school. If the child were to open the door or the gate at any other time during the day, the consequences could be very serious for both your child and possibly someone else. We would therefore appreciate it if the children do not open the door or the gate at any time. Nutritious and delicious lunches will be served daily. The teacher sits at the table “family style” and serves the children lunch. Children are asked if they would like “a lot” or “a little”. Seconds of lunch are available but only one dessert. We also provide morning and afternoon snacks. The menu is posted near the door in each room. Please note we are a peanut butter/nut free school. Please keep this in mind if you send a treat to school for some reason. (e.g. birthday) Also if your child has peanut butter for breakfast, please make sure his/her hands are washed thoroughly and their teeth are brushed before coming to school. During the winter months, some schools close because of bad weather. This school does not usually close. If you have any doubts about us being open, please phone the school. Children are observed regularly to reassure parents and teachers that they are developing “normally.” If there were any concerns about your child, we would notify you immediately. Children with special needs are included in our program. They are supported by a Resource Consultant from Children First and provided with programming to meet their individual needs. Sunscreen will be provided by Story Book Early Learning Centre. The brand name is Croc Bloc. It is paba free and hypo-allergenic with an SPF of 30. Sunscreen will be applied to all exposed skin, including the face, tops of ears, arms, legs, bare shoulders. It will be effective from 10:00am to 4:00 p.m. If you do not want us to apply our sunscreen to your child please notify staff and apply your sunscreen at home before your child arrives to school. Please check out the guarantees posted in your child’s room. We do have students doing placement from time to time from St. Clair College and E.D.H.S. Students do not have unsupervised access to our children. Story Book Early Learning Centre is licensed under the Ministry of Education. The license and license information is posted in the classrooms and is available to parents. Information is also available on the Ministry web site for Licensed Child Care. A.M. Parents are often in a hurry. The child often settles much better if “Good- bye” is not prolonged. Also parents may have some information to pass on such as if another person is picking up, the child has medicine, etc. Not only is it a display of good manners, but it is also important to us to greet you at the door. P.M. Occasionally the child gives the parent a hard time at pick up. It is important to us that the parent and child leave school happy with each other. It is also a chance to find out how the child’s day was. It is a nice way to collect up “the stuff” and put closure on the day. Behaviour Management is an on-going process. We find that advising children of proper behaviour and verbal re-direction works best. Direction is given in a positive way e.g. “Inside we walk.” If time out is given, it will be a restriction in play space such as at the table beside the teacher rather than on a chair by themselves. We have a lot of fun here while learning, exploring socializing, creating and much more. We are glad your child is a part of it. Please feel free to contact the Executive Director at any time, if you have any questions or concerns about your child or the program @ 519-776-7772.